Manchester Thunder returned to the top of the Netball Superleague after they thrashed Strathclyde Sirens 62-36 on Monday. Thunder were second going into the game, level on points with defending champions Wasps, but moved three points clear after the win in Glasgow. Wasps had got back to winning ways with a convincing 67-35 victory over London Pulse on Sunday. Loughborough Lightning staged a stunning comeback to beat Saracens Mavericks 54-49 - and stake their claim as very real title contenders in round 12 of the Superleague. Wasps had lost three of their previous four games going into this match, prompting head coach Mel Mansfield to suggest the result was all-important. "It was a good win for us, this game was all about getting some belief back in the team," she said. "I was delighted that they pushed on and won by a big margin. It wasn't the finished article but we've got a lot of rounds to go yet to perfect our play." Team Bath were also in action on Monday and recorded their sixth league win in a row, beating Surrey Storm 57-48. The victory moves Bath up to third in the table, while Surrey drop to eighth. 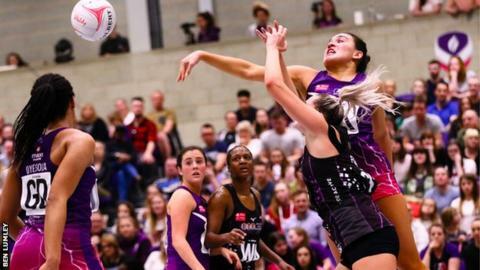 Loughborough Lightning have now beaten three of their top four rivals, following up wins over Thunder, Wasps with this home victory over Mavericks, to avenge a heavy loss in the reverse fixture. Team Bath, who are also in the hunt for a play-off place, are the only side Lightning are yet to beat. The win in front of a capacity 900-strong crowd lifts Lightning above their opponents to third in the league table. Mavericks controlled large periods of the first half but Lightning's second-half performance echoed how their season has unfolded so far - slow out of the blocks but once they hit their stride, they are unstoppable. They outscored Mavericks 32-24 in the final two quarters, sparked into life once again by the impressive Nat Panagarry in the centre-court, who seamlessly linked up play between defence and attack, which eased the pressure on shooting duo Mary Cholhok and Ella Clarke. Severn Stars played out a tug-of-war style game against Celtic Dragons, sneaking their fourth win of the season by a single goal, 53-52. Sirens were without their starting shooter Cat Tuivaiti for the remainder of the season after she announced she is expecting her first child with Pro14 rugby player husband, Jimmy. You may remember Oscar the dog from last week's league round-up, after he offered a little bit of pet therapy to his friend and Wasps player Jade Clarke after her side narrowly lost to Thunder.